TeslaPittsburgh.com: Model 3 Reaction - WHEW!! I flip flopped several times on whether or not to stay up to watch the unveiling and, in the end, decided to go to bed. My thinking was that regardless of whether it was good or bad, my brain would be churning with all the new information and possibilities and not be able to calm down and sleep. Whereas I can psych myself out well enough to go to bed on time and pretend nothing is happening. Worked! Watched the whole presentation first thing in the morning AND had follow up specs/details/reactions from the automotive press already waiting for me. So. That all said as an introduction, I think there is no doubt that they've hit it freakin' out of the ballpark. Tesla tweeted that the first week total was over 325,000 already, so I guess I'm not the only one. I LOVE the overall look. Totally knocked it out of the park-- a compelling car that looks DAMN good. Imagine that parked next to a Volt or a Focus. Or Prius or a Bolt. MIC. DROPPED. The styling is familiar but gorgeously freshened (I expect the Model S to adopt a few of the cues) and it has a LOT of personality and dynamic lines-- completely unlike the bland or "safe styling" of the competition. Tesla went BOLD. The nose when it was on the podium looked a little odd (the headlights and DRLs are perfect though) but once pictures and video started emerging from the test rides-- taken with the slight downward view of standing person (like we'll see it for real) instead of being on an elevated stage-- all my worries about the nose evaporated. The nose being plain doesn't photograph as well in the early pictures because people were looking UP at the nose on stage. Pictures coming out afterward during the test rides were more realistic of how it looks-- with the lean forward section (like the old BMWs! YAY!) dropping into shadow. That combined with the swept back headlights and rounded over fenders with their creases reaching back to the body line? Ahhh-- freakin' gorgeous. 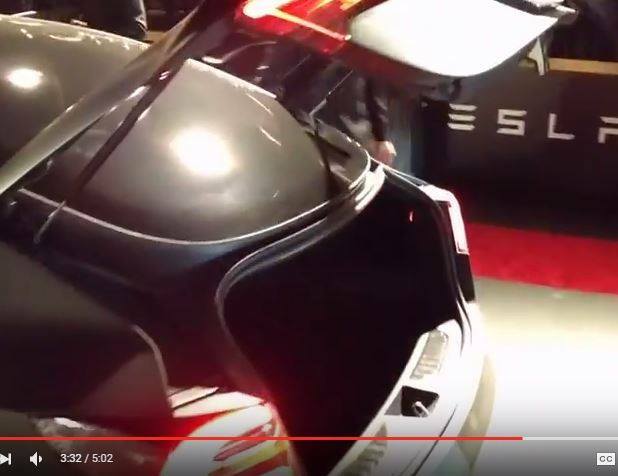 The trunk is not a hatchback, which REALLY surprised me. I guess they had to make that trade off to remove the rear seat's overheard beam, but while that big piece of glass is great for rear passengers, the lack of a hatch limits utility a bit. I hope they come up with a way to change that, but the detailed mechanism suggests it wasn't a last minute decision. The rear section is more complex than the S because it's jamming a lot of lines into a smaller space. I would like to see them side by side just for comparison's sake. But while the lack of a rear header beam in the backseat is great for rear passenger headroom, the extra long piece of glass means no hatchback. That just leaves a wide, low slot to slide things into the trunk. Okay for suitcases, but horrible for things like groceries. And no more hauling large items. Definitely not sliding a bike or a piece of furniture in there-- even if the seats fold down. Instead you get a large parcel shelf accessible only from the backseat. Not the more utility-friendly set up. I hope they change that. The interior-- Not a big fan of the protruding center screen. Looking over might be something to adapt to, but I'd feel better if there was some kind of driver centric panel-- perhaps even a heads up display onto the glass? If they were going to do a HUD I could see them keeping it quiet for now because the S doesn't have one... So if the S gets one, we'll know they're thinking about it. I like having gauges behind the steering wheel and have never been a fan of centered instrumentation. 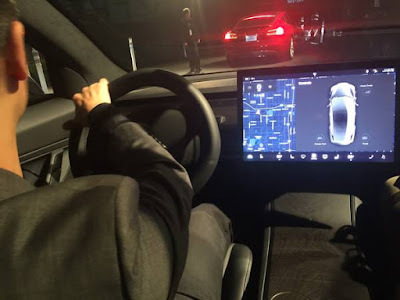 I get what their thought processes are-- that Autopilot necessitates a change in how much display we need, especially on the highway-- but maybe they'll offer a heads up display on the windshield to make purists like me happy. The panel's lower corners seem to impinge on knee room a bit. I'd rather see them clip the corners and have a trapezoidal panel or a T shaped one that extends onto the center console itself. Would be nice if they reshaped the screen a little too-- maybe more of a "T" shape onto the console? The lower corners just look like they'd get a lot of banging into by knees and hands. That said, perhaps it doesn't matter at this point, because...well... ELON. None of the prototypes were lit inside very well, but it appears the wood trim covers the top of the entire center console and also has a 6" wide swath across the front of the dashboard from door to door. With a big board of gorgeous wood across there I might forget all about my heads up display and other niggles. I really like that silvery matte color was very eye catching. I hope it makes it into production-- but I suspect my wife really just wants her shot at Signature Red. Only other "concern" is the lack of opening panoramic sunroof. I love mine. I would miss it. Glass is great... But sometimes you just want OPEN. Anyway-- otherwise LOVE it. Totally relieved! 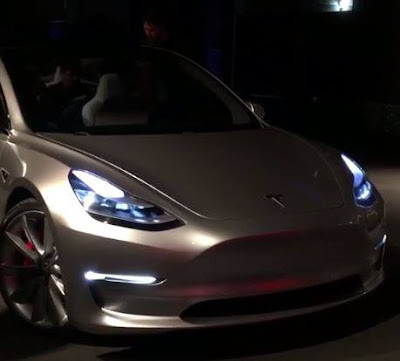 The wheels were gorgeous and-- thankfully-- already confirmed for production. Supercharging still seems up in the air but... Every thing I've read and knowing Elon's history, the cars will all come with Superchariging included. Don't worry about it. It's been years since Tesla broke that out as a cost option and I don't see them doing it again. The network was young and small then. We'll be doing a large battery, performance version. AWD. If the range matches or beats our S, I could easily see that becoming the favored road trip car (since it'll have Autopilot).